J.Lo has been making the press rounds the past few weeks promoting her new movie, The Boy Next Door, but it seems like what she’s really promoting is her iconic, envy-inducing glow. In fact, the first question she was asked when she stopped by Andy Cohen’s Watch What Happens Live talk show was, “what are your makeup secrets? !” While she wouldn’t reveal her exact method, we have some tips, tricks and product picks that will help you achieve the glam, gorgeous look. 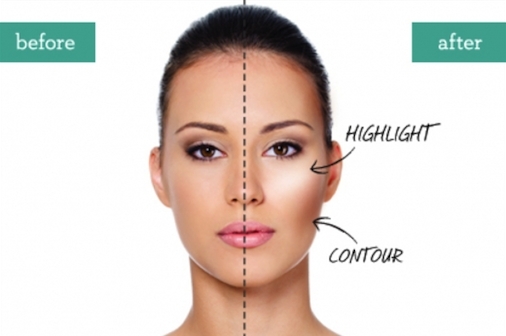 Highlighter has risen in popularity over the past few years and with good reason. This finishing touch product adds depth and dimension to your face, while giving off an ethereal glow. Just like bronzer, it’s important to place highlighter in certain areas, not blindly across your entire face. Focus on the highest point of your cheekbones (smile to get this right), the middle of your forehead, on your brow bone, inner eye corner, down the bridge of your nose, your Cupid’s bow and your chin. FOREHEAD: For highlighter to appear natural, it should be placed where the sun would hit your face. Start by applying in the middle of your forehead, then brush it out to blend it. BROW BONES: Highlighter serves three purposes on your brow bones. It helps blend any harsh shadow lines, makes eyes appear bigger, and it can detract from grown-out bushy brows that you didn’t have time to pluck. INNER EYES: This is a pretty well-known trick when doing eye makeup. Add a white or champagne colored shadow in the inner corners of your eyes to open them up and remove signs of fatigue. NOSE: Swipe some highlighter down the bridge of your nose to make it appear slimmer. CHEEKBONES: After you apply your bronzer and blush, brush a dusting of highlighter on the tops of your cheekbones. This will add dimension and give the appearance of sculpted, model-esque cheekbones. CUPID’S BOW: Apply a dab of illuminator on your Cupid’s bow to create the illusion of fuller lips. CHIN: If your chin is small and you want to bring it out, swipe a bit of highlighter there. I personally don’t like the way it looks on my chin, but test it out and see if it flatters your facial structure. Now that you know where to apply your highlighter, it’s time to find the one that will work best for you. There are tons of incredible luminizers on the market. Powders, creams, liquids. Drugstore, high-end, indie. Read on for our ten favorites of the moment. Bobbi Brown Shimmer Brick: This is my personal Holy Grail product. I discovered it a few months ago and don’t think I’ll ever go back. With just one swipe, I have an ultra-shimmery glow that lasts for hours. It’s available in a wide variety of pink, peach and bronze shades. It’s definitely on the pricey side at $44 for one compact, but it lasts forever. A little goes a very long way. BECCA Shimmering Skin Perfector in Opal: This cult-status beauty product is a favorite on the Pampadour feed. Every user who’s tried this luminizer swears by it! The creamy powder has ultra-fine luminescent pearls that reflect on your skin for a naturally gorgeous glow. Benefit Cosmetics Watt’s Up! : This cream, champagne highlighter gives off a major glow, and is so easy to apply. I love using it when I want to highlight different areas, like my jawbone or temples. Use the attached blender to make the luminous sheen as natural as possible. theBalm Mary-Lou Manizer: This highlighter by theBalm is a favorite amongst the biggest YouTube and Instagram beauty gurus, but the adorable retro packaging is what hooked me. It just looks like something you need to have in your makeup bag. The actual product is just as great: it’s so pigmented that it can double as an eyeshadow! MAC Mineralize Skinfinish in Soft and Gentle: MAC’s velvety-smooth highlighter feels like butter on your skin. The metallic finish is the perfect touch that gives it that ‘MAC glam’ look. Soft and Gentle is a gorgeous peachy-bronze that Pampadour users adore, but the item comes in other shades too! Shiro Cosmetics Highlighter in Curaga: Shiro Cosmetics is an indie brand you might not know, but definitely should. Vegan and cruelty-free, these handmade products come straight from Portland, Oregon. Curaga is an absolutely gorgeous, pearly, light-gold toned illuminator that will flatter most skin tones. Plus, you can feel good about supporting an up-and-coming line from the good ol’ US of A.
NYX Born to Glow Liquid Illuminator: I really adore NYX. It’s the perfect combination of drugstore affordability and high-quality products. You almost always get a bang for your buck. The Born to Glow Illuminator comes in two pretty shades – pale pink Sunbeam and golden peach Gleam. With a liquid highlighter, you can either apply it like you would a powder (as a final step) or mix it into your foundation for a glowing base. TONYMOLY Crystal Light Highlighter: The latest trend taking over the beauty world? Korean products! TONYMOLY is a hard-to-find, incredibly well-received Korean line. Urban Outfitters carries their highlighter on their website – at $12, give this pink, luminous liquid illuminator a shot. YSL Touche Eclat: Makeup artists swear by nifty little pen. Wayne Goss even has an entire video dedicated to all the inventive ways you can use it. The most common use is going over your concealer with it, to create the appearance of wide-awake, bright eyes. Josie Maran Argan Illuminizer: This soothing, light illuminator from Josie Maran has a hint of bronze for a sun-kissed look without bronzer. I personally adore Argan oil. It makes my skin feel soft, silky and luminous…I love that Josie has almost single-handedly brought this ingredient into the mainstream. For an extra touch of glow, apply some of this luminizer to your collarbone and décolletage. LA Girl Pro Conceal: Yes, this product is technically a concealer, but I feel like it works just as well as any highlighter. Go for a shade that’s lighter than your natural skin tone, use it over your nose, forehead, etc. and blend away! A Beauty Blender is ideal for this specific product to make sure there are no harsh lines. This is great for someone who doesn’t want a shimmery highlight. Do you use highlighter? What’s your go-to product? Let us know in the comments below and on Pampadour.com!